The facilitator’s guide assists when presenting the video Anywhere, to Anyone. It includes detailed outlines of domestic violence in the Deaf community, a preparation guide, common myths & facts about domestic violence, and guidance for discussion after the viewing. The audience handbook is a helpful guidebook which includes information and education about domestic violence, safety planning, how to support a friend or family member, and community awareness. A necessary tool to use with the video Anywhere, to Anyone. A followup on the videotape Anywhere, to Anyone on domestic violence in the Deaf Community. This video talks more in depth about safety planning and how to receive help when leaving an abusive relationship. It also shows how the Deaf Community responds to domestic violence. The entire video is in American Sign Language with English subtitles. Actors portraying Deaf people are Deaf in real life. 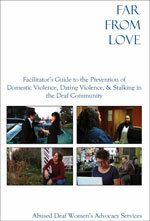 The objectives of this guide and DVD are to gain awareness about domestic violence in the Deaf community; understand how to support victims/survivors of domestic violence; shift accountability to the abuser instead of blaming the victims/survivors for violence; discuss solutions to ending violence in the Deaf community. This covers many important issues of sexual assault in the Deaf Community. There’s also a companion guide book about sexual assault, types of sexual assaults, who the victims and offenders are, how to help a victim, & what you can do.